Filmmaker Phil Cox has produced a wonderful documentary exploring the life of funk singer Betty Davis. A model and uninhibited performer—famously described by Miles Davis as being even too wild for him to handle—Davis oozed unbridled sexuality. As the documentary Betty Davis: They Say I’m Different makes clear, she was Prince before Prince and Madonna before Madonna. The challenge for Cox? Davis turned her back on music and society during the 80s, becoming a recluse who refused to come out from the shadows. The documentary is stunning visually. With performance clips, album covers, photo shoots, and music tracks, we easily understand her appeal. 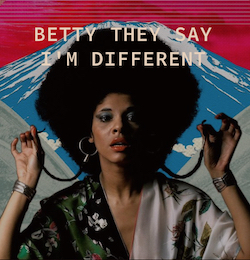 Before she became funk queen extraordinaire, Betty Davis tried to break into the music industry with a handful of studio singles during the 60s. None of those three songs, nor a demo album recorded in 1969 with the help of Miles Davis, succeeded in landing a recording contract. (The demo album was eventually released in 2016, showing her evolution to a Sly-esque funk sound that became her trademark in the 70s.) The minor label Just Sunshine released her first album, titled Betty Davis, in 1973. The music revels in raw funk, and established the style that made her a cult icon. Two albums followed in 1974 and 1975, but despite two minor hits on the R&B chart, she failed to crack the big leagues. The album she recorded in 1976 with a band that included Herbie Hancock—and which many consider her finest work—was shelved until its release in 2009 after she had vanished from the scene. Cox deserves kudos for working patiently with Davis over several years. He allowed her to emerge from her shell on her own terms. Thus, at her request, we get only fragments of her visually: the back of her head in her small apartment, her voice, one eye in a slice of face. She speaks poetically about the crow outside her window as a girl that symbolizes her spirit. But she reveals nothing to explain the mystery of her reclusiveness. We learn from former friends and bandmates how her father’s death and mistreatment by record labels devastated her, which at least provides a hint of a clue. But what a shame that someone who has attained such a respected, cult status as a trailblazer remains so silent. Because so much about her remains a mystery, I would have preferred for Cox to get inside the music more. He could have explored links in the development of her style, the process for turning her musical ideas into recordings, her influence in the funk universe. Instead, we come to the end of the film understanding little more than when we started. At least we’ve enjoyed the ride, though. For more info about the film, check out www.nastygirlmovie.com. What if your house was a musical instrument?